It’s ROCK-TOBER! Wolfman Jack LOVED “Howl”oween, for obvious reasons. His howl lit up the airwaves in 1965, but not so much in song. It may not have been October, but sometime in 1965 Wolfman Jack and The Wolfpack released a self-titled album (Bread label), with Wolfman Boogie, Parts 1 & 2. Without a trick in sight, this month’s 50 Years Ago tribute is a sweet Halloween treat! In BFYP’s Book I (1954-1959), we explored Wolfman Jack’s youth. Enjoy the excerpt, and learn about the boy who became a wolf! Ooooowwwww! Featured Radio Survey(s): While Wolfman Jack made radio history in the West at XERB 1090 / Rosarito Beach, Mexico/Los Angeles, WQAM / Miami, Florida, used magic on listeners in the East, with the Lovin’ Spoonful’s “Believe in Magic” at #8 on their Fabulous 56 Survey, October 2, 1965. Blast from Your Past, Book 1 – Excerpt 6: WolfmanJack! Have mercy, it’s WJ break-time! It’s time for a WJ break, here at BFYP-FM. 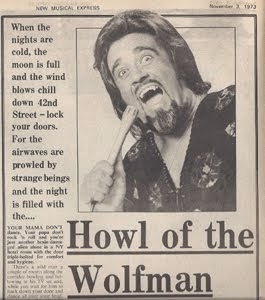 Yes, a Wolfman Jack story is nigh. Wolfman Jack, You Da Man! Best known around the world. Let me introduce you to … Wolfman Jack! “Bob” was still finding his way as an unruly teen in the 1950s. His youthful story is crucial, however, to understanding what powered the ultimate Wolfman. Our favorite mystifying DJ gained fame in the 1960s and plowed through the next few decades until his too-soon death on July 1, 1995, at age 57. Bob Smith’s rise up the DJ ladder is told in the words of friends and co-workers, and from his own tales in a comprehensive autobiography, Have Mercy! Confessions of the Original Rock ‘n’ Roll Animal. It’s raw and rebellious, and according to long-time friend, Lonnie Napier, not even half of the whole experience. “It’s just a fluff piece,” scoffs Lonnie. Wolfman Jack said of Have Mercy! “Folks, I’m real nervous about getting this book right.” I too, want to do right by Robert Weston Smith, aka Wolfman Jack, and all of the DJs on these pages. 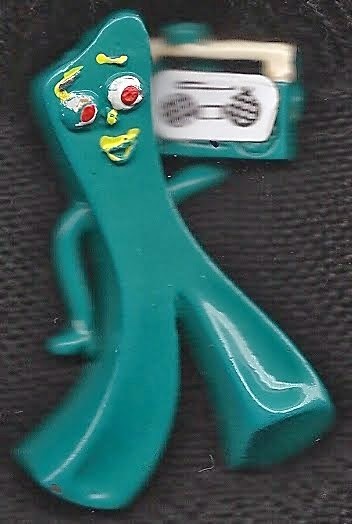 Like many of you, he and they were a part of my youth that I thoroughly enjoyed. Even after I discovered he wasn’t Black. Heehee. In addition to his lively memoir, to which I sincerely thank Wolfman’s “WolfWoman,” Lou Lamb Smith, for granting permission to quote, I’ve found some great references and citations in obscure places that complement my interviews with Lonnie, and Wolfman’s writer, Frank “Mars” Cotolo that should keep us Rocking & Rolling with the Wolfman all night long. Wolfman Jack is one of the few nationally known DJs who transcends time and geographic locations to touch nearly every music lover of the era. Because BFYP is dedicated to him, he also is the only DJ whose story marches beyond 1979. And to read Wolfman Jack’s Have Mercy! is to listen to him talk in your head. You can hear the deep rattle in his voice, and feel the words vibrate with his witty personality. Unless otherwise noted, all quotes are from his book. Though Have Mercy! is maddeningly vague and scrambled about dates, Wolfman is forgiven as, like many of us, he admits his memory is a little hazy about the good ol’ days. Robert Weston Smith was a real-life example of budding “bad kid gone good.” The second child of loving parents, born in Brooklyn January 21, 1938, to Rosamund and Weston Smith, he blamed the stock market Crash of 1929 for their financial struggles. Bob’s creativity however, was certainly an inherited trait. Riding out the ’29 Crash, dad, Weston, began writing for Financial World and the Wall Street Journal in the mid-1940s. Through his steady rise in status at Financial World Weston introduced his family to film stars and major TV celebs like Milton Berle and Ernie Kovacs. Children will never understand the drama behind divorce—they know only the abandonment and experience the fear that they somehow caused it—which is usually far from the truth. Bobby “became a junkie for approval and recognition,” teaching himself to read people to make sure they like him. He grew to be the consummate salesman who always has what you didn’t know you were looking for. Coping with family stress can make or break a kid. 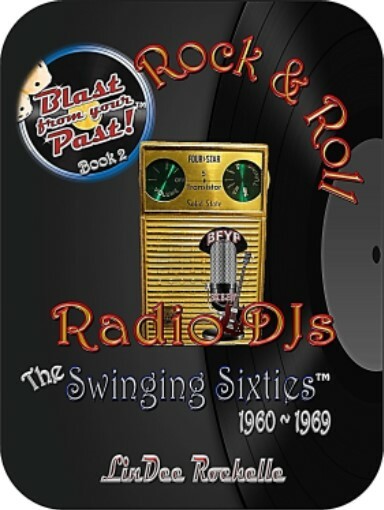 Through the divorce, their parents’ rapid remarriages, and a couple of half-siblings to tolerate, by the mid-Forties Bobby and older sister, Joan, often soothed their ruffled souls listening to the radio until bedtime. A case of mononucleosis around the age of eight, however, took Bobby past idle listening. The flu-like malady treated at the time with prolonged rest, made the bedside radio his constant companion. That was back when dramatic shows and comedians’ sketches ruled the airwaves. The inimitable Jack Benny made him howl with laughter, while the “Shadow” and the “Green Hornet” piqued his adventurous crime-fighting interest. Rock & Roll was nowhere near the radio dial, still only a glimmer off the guitar strings of Rhythm & Blues songsters. Skipping through family angst and teenage unrest, Bob escaped a future of gang life and attributed his good fortune largely to sister, Joan, and Francis Gregory, “Tantan,” the family’s maid / nanny. “She was family—more like an active, ever-present grandmother than a servant,” he wrote. Tantan’s presence during his formative years followed him through to adulthood (although she couldn’t abide the merry-go-round marriages and left when he was still young enough to miss her hugs). Subsequent summers with mom, school months with dad, took their toll on him. By the early 1950s Bobby classified himself as a “juvenile delinquent” (a relatively new term at the time for troubled teens). Luckily, his fanatical interest in radio and XERF* began to divert his attention from the streets. Although the Manhattan kid listened to WINS/New York during the day, the Mexico blaster and nighttime only station captured his impressionable nocturnal imagination. So at sixteen in 1954, it was no stretch for Bob to embrace Alan Freed in his new Rock & Roll gig at WINS/New York. Already familiar with Alan from his Moondog show out of Cleveland, Bob told himself right then and there, “I don’t care what. I’m gonna definitely be part of this.” He didn’t know how; but then, that’s what dreams are made of. Alan Freed’s first of many shows at the Brooklyn Paramount Theater was not going to happen without Bob Smith. Aiming for an experience beyond audience level, Bob wangled his way to the side of the stage (imagine that—this was before decades of stalker fans brought on celebs’ high security), and according to his memories, over the five-day event, Bob became “Smitty” the gofer. Fun tales are recalled, like his task to give the two-minute on-stage warning to Jackie Wilson, then lead singer of Billy Ward and the Dominoes. Bob walked in on Wilson and his girlfriend hastily readjusting their clothes (wink, wink). And young Smitty’s eyes widened at the big wad of cash in Alan Freed’s hands as the crew waited for payroll … yep, he was destined for radio stardom. School days, school daze, good ol’ Golden Rule … fades. By 1956 dad Weston and stepmom Marge, moved to “uppity” Short Hills, New Jersey, and enrolled Bob in a trade/tech school to become an electrician. This was not the kind of electricity Bob responded to; a consummate daydreamer, he nearly electrocuted himself and another student. That’s when he finally took control of his future. Gee—here’s something none of us have ever done—Bob left home every day “for school” and detoured over to Newark’s WNJR. Making friends with the receptionist he parked himself in the lobby listening to the broadcast until a guy who looked like he worked there ambled through. Bob stood up, introduced himself, and asked if he could watch and learn—he really wanted to study the radio business. He asked the right guy. Although Bob rationalized that he was not truly deceiving his parents, he was attending a trade school—of sorts. Just not the one they were paying for. Logging five or six hours a day, as Smitty the Gofer again, Bob caught a big break when his engineer friend, Jim, called in sick. Ignoring their fears of union issues, station management let Bob run the board for Mr. Blues (the first White DJ he once thought was Black). Of course, the real issue was the show began at dinnertime—when Bob was supposed to be home from “school.” Oh yeah, he was busted. What do you do with a habitually truant teenager? Well, the Smiths shipped Bob off to a school for problem kids. The security was tighter, but Bob had the radio bug and when he faked sick again … in a way he was. He had radio fever! That was not the final act that split Bob from his family, however. Plain ol’ sibling rivalry broke the straw. Always with some sort of radio studio setup in his room or the garage, one day Bob needed to replace his broken turntable. Siblings should share, right? His thought exactly. So he borrowed his stepbrother’s. Unfortunately, the also-troubled-teen didn’t see things Bob’s way. He told mom. With an apology, Weston handed Bob $300 (a lot of money in the late Fifties), and told him it was time to go out on his own. Bob didn’t hesitate. He grabbed his best friend, Ritchie, shot down to the used car lot and plunked down most of his dollars on a dark green 1949 Buick convertible with a Fireball 8 under the hood. That isn’t to say he wasn’t hurt and more than a little confused. But the two good-looking young’uns experienced that first naïve rush of newfound freedom that we all savored—and feared—when marching out our parents’ door for the first time. For Robert Weston Smith, it was Hollywood or Bust! 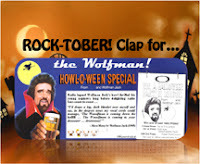 Experience Wolfman Jack on YouTube – start here, and be-bop your way down the line! Missed BFYP-Book 1 (1954-1959) excerpt or two? See below!